The genus name Spheniscus is derived from the ancient Greek word sphen, which means wedge, referring to the streamlined body shape of the African penguin. The species name demersus is Latin meaning plunging or sinking, referring to its diving behaviour. The common name ’jackass’ refers to its call, which sounds similar to that of a donkey, even though most other penguins produce a similar sound. The African penguin is endemic to coastal areas of southern Africa. It is a charismatic species that is known for its loud donkey-like braying noises, distinctive black and white plumage and large breeding colonies. It is a flightless bird that is well adapted to life at sea and land. The body is streamlined with modified wings that resemble flippers, which enable them to be efficient swimmers, and a thick coat with overlapping feathers that assists with waterproofing, wind resistance and insulation. The African penguin has experienced rapid population declines over the past century as a result of overexploitation for food, habitat modification of nesting sites, oil spillages, and competition for food resources with commercial fishing. As a result it is classified as Endangered by the IUCN Red List and it is listed under Appendix II of the CITES (Convention on International Trade of Endangered Species). In South Africa, it is further listed as a protected species under the National Environment Management: Biodiversity Act (No. 10 of 2004). African penguins are flightless aquatic birds with reduced wings that are modified to form efficient flippers for swimming and they have heavy bones to enable them to dive. The feathers in adults are specialised to form a thick coat of overlapping layers that assists with waterproofing, wind resistance and insulation. The dorsal or back part of the body part is black and the belly is white. The white belly has a thick black stripe curving across the top of the chest, and down the flanks towards the legs. African penguins have black webbed feet and a black facial mask with distinctive pink patches of skin above the eyes. Each African penguin has a unique and distinct pattern of black spots on the white chest that can be used to distinguish individuals from one another. The African penguin has a black bill and shortened tail. Males and females have the same plumage, making it difficult to differentiate between sexes. However, males can be distinguished from females by a slightly bigger and broader bill. Adults weigh on average 2.2–3.5 kg and are 60– 70 cm in height. Juveniles differ from adults in having blue-grey plumage with no white facial markings and no bold, delineated markings. They have dark upper-parts lacking both spots and band on the chest. African penguins are very clumsy on land, waddling upright with flippers held away from the body as if they are drunk. They are, however, highly specialised for a life at sea and they are efficient swimmers that can reach speeds of up to 20 km/h, cruise at 4–7 km/h and dive down to 130 m.
African penguins communicate by means of vocalisation and displays. Vocalisation includes loud, donkey-like braying noises as well as barking and growling. Chicks can produce a whistling ‘peep’ to request food and a hissing sound. Aggressive displays include an individual pointing its bill directly at another, pecking, bill-slapping and beating one another with flippers. Comfort behaviours include preening of feathers and rubbing and scratching of the head. The African penguin is the only penguin species that occurs off the coast of Africa, and it is endemic to the coast of southern Africa, from Hollams Bird Island, near the central Namibian coast, to Algoa Bay off the coast of the Eastern Cape, South Africa. 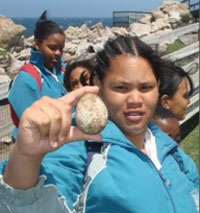 They occur mostly on islands along the coast, but there are two populations on the mainland in South Africa, at Betty’s Bay and Boulders Beach in the Cape Town area. 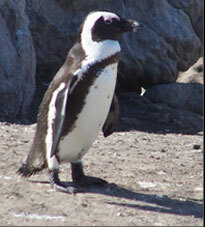 African penguins are found along coastal areas and offshore islands. Their preferred habitats are flat sandy areas with sparse or abundant vegetation growth, or steep, rocky sites with sparse vegetation. African penguins may forage on their own or in small groups. Their diet differs from region to region but their primary diet includes small pelagic fish such as pilchards, anchovies, horse mackerel and herring. African penguins may supplement their diet with squid and small crustaceans in areas where there is a decrease in fish abundance because of commercial fishing. African penguins usually forage at depths of <80 m and during breeding seasons, they may forage 20 to 40 km away from their colony. 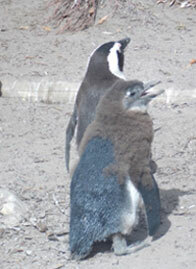 However, during the non-breeding season, the penguins can travel much further away from the colony. Foraging does not take place at night. African penguins are monogamous (breed with one partner for their entire life) unless breeding has failed for some reason, then they will take another partner. The penguins breed in colonies mostly on rocky shore islands and each breeding pair will return to the same breeding colony and same nesting site each year. 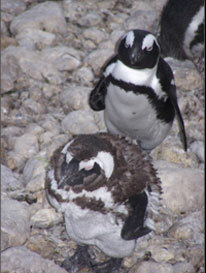 Previously, African penguins excavated their nests in layers of guano that existed on most islands, but after most guano deposits were depleted through commercial exploitation, African penguins were forced to use alternate nesting places. These include burrows in sandy soils, depressions under boulders or vegetation, crevices between rocks and in man-made nests. The nest is lined up with various types of material that includes seaweed, rocks, shells, bones, vegetation pieces and feathers. African penguins have an extended breeding season, which enables them to breed throughout the year. The peak of the breeding season in Namibia (November to December) tends to be earlier than the peak for South Africa (March to May). African penguins usually produce one to two eggs per clutch and incubation lasts 38–41 days. Responsibility to incubate the eggs is shared equally between both sexes. When one parent is incubating the egg, the other will head out to sea to forage or head out to collect vegetative nesting material. Each parent has an incubation ‘pouch’ located on the body to keep the incubation temperature constant. Eggs do not hatch at the same time (asynchronous hatching) and usually hatch about two days apart. The chicks are brooded for the first 15 days after which the chick attains control over its body temperature. The parents safeguard the chicks for the first 30 days, after which they are mostly left unguarded. The unguarded chicks may form crèches of up to 55 chicks. Chicks are dependent on their parents for food, which is fed by direct beak-to-beak regurgitation, and they only become independent of parental care three months after hatching. The first moult occurs after 14 days followed by a second moult at 40–60 days, and juvenile plumage develops at 70–80 days. The chicks are fully fledged after 70–90 days. The fledgling juveniles will go out to sea on their own and return to their colony of birth after about 12– 22 months to moult into their adult plumage. The age at first reproduction ranges between four and six years and life expectancy is up to 27 years in the wild. Moulting in birds is energetically expensive and African penguins have developed a moulting strategy that replaces all their feathers in a relatively short period of time in comparison to other birds. Moulting is essential for ensuring that penguins remain waterproof and insulated in cold water. During the pre-moulting phase, penguins will go out to sea to fatten themselves for the moulting period. Pre moulting adults accumulate fat reserves needed during the moulting period by spending five weeks prior to moulting feeding to gain up to 31% of their normal body weight. During moulting penguins are unable to forage because their feathers are not yet waterproof and they therefore do not feed for about 18 days. After moulting, the penguins will head out to sea in their new feathers and spend about six weeks replacing the fat reserves (around 41% body weight) lost during the moulting period before the onset of the breeding season. Predators of the African penguin at sea include Cape fur seals (Arctocephalus pusillus pusillus), sharks and killer whales (Orcinus orca). On land, predators include mongoose, Cape genet (Genetta tigrina), domestic cats and leopard (Panthera pardus). Kelp gulls (Larus dominicanus), large herons, rats and African sacred ibises (Threskiornis aethiopicus) prey on eggs and chicks. 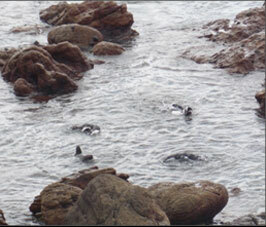 African penguins also compete on land with Cape fur seals, gannets, cormorants and other sea birds for breeding space. Although African penguins are well adapted to survive cold aquatic environments, they are also able survive in warm terrestrial environments through physiological and behavioural adaptations. The African penguins are mostly active at their breeding sites during dusk and dawn. Breeding pairs nest in burrows or some form of shelter that provides protection from the sun. Non-breeding African penguins cope with the heat by spending most of the day at sea, regularly swimming, or loafing on the beach in groups. Penguins that are out in the open during the day usually turn their backs to the sun, so that their feet, flippers and face are shaded. The distinct pink patch of skin found above the bird’s eye helps the bird to cope with changing temperature. As the external temperature around the African penguin increases, the bird’s body sends more blood to the glands found at these pink patches of skin, causing the pink patches to change colour and turn a darker shade of pink. This in turn causes the glands to be cooled down by the air surrounding it. Another response to overcome heat stress is panting. The African penguin’s black back and white belly colouration is an important form of camouflage at sea. The white belly deters predation from underwater predators looking upwards and the black back deters detection from predators swimming above the bird whilst looking down onto the dark depths of the water. The birds’ heavy bone structure makes it possible for it to dive to deep depths. African penguins and other sea birds that feed on fish can be used as indicators of location and variability of marine resources and ecosystem changes. The African penguins also form part of the diet of top sea predators such as sharks and seals. Historically, African penguins were exploited for food, fuel to supply ship boilers, and were rendered down for fat. Their eggs were also collected and used as a source of food. The rapid population decline of the African penguin between the 1920s and mid-1950s is largely attributed to overexploitation of eggs, where 48% of all eggs produced were collected for human consumption. Further population declines were caused by habitat modification of penguin nesting sites through the extraction of guano that is a preferred substrate for constructing nesting borrows. The lack of guano deposits led to poor recruitment because penguins were forced to breed on unideal surfaces such open ground, were they were exposed to extreme weather elements and the eggs and young chicks suffered increased predation from predators. The two practises of egg collection and guano extraction have since ceased but other eminent threats have emerged and these include oil spillages and competition with commercial fishing for food resources. Because of their restricted distribution range, oil spills can affect large proportions of the population, leading to high mortalities and impaired breeding success. The fishing industry competes with the African penguin for food resources, especially for sardines and anchovies. Reduced abundance of these fish species as a result of over-fishing might lead to further decline of the African penguin populations. 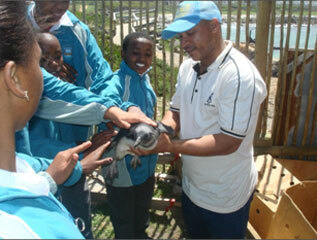 Currently, African penguins are included in for ecotourism, education and research activities. Most colonies of African penguins are inaccessible to people, however there are two mainland colonies (Boulders Beach, Simon’s Town and Stoney Point, Betty’s Bay) along the coast of the Western Cape, South Africa, which provide opportunities for the public to observe the African penguins in their natural habitat. The African penguins are undergoing very rapid population declines. The initial records of African penguin populations along the Namibia and South African coastline estimated around one million breeding pairs in the 1920s but these populations have rapidly declined to less than 30 000 pairs. For example, it is estimated that breeding population in South Africa has experienced a 95% decline in six years from 69 000 pairs in 2001 to 20 000 pairs in 2011. As a result it is projected that the African penguin may become extinct within the next 15 years. It is roughly estimated that about 169 African penguins are found captive in South Africa. These penguins are found at Bayworld, the National Zoological Gardens in Pretoria, Bester Birds, East London Aquarium, Hartebeespoort Aquarium, SANCCOB, Sea World Durban (housing the largest number of birds), Tenikwa Wildlife Awareness Centre, Two Oceans Aquarium and World of Birds. In May 2005, the IUCN (International Union for Conservation of Nature) classified African penguins as Endangered. Currently the species is listed under Appendix II of the CITES (Convention on International Trade of Endangered Species) and is therefore regulated according to this convention’s guidelines. In South Africa, the movement of African penguins from one captive population to another is regulated by a permitting system, which works alongside relevant national or provincial laws. Several management actions that have been implemented to conserve the African penguins include formal protection of breeding colonies by converting areas with known breeding sites into nature reserves and national parks, prohibiting the collection of guano and eggs, establishing marine protected areas where fishing is prohibited, ongoing research to monitor population trends in relation to prey availability and disease outbreaks, active management of population sizes of predators, artificial care of abandoned chicks, providing artificial nests and rehabilitating sick birds. Some of the leading organisations in the conservation of the African penguin include the South African Foundation for the Conservation of Coastal Birds (SANCCOB), Dyer Island Conservation Trust and South African Marine Rehabilitation and Education Centre (SAMREC). The African penguin is one of four species of banded penguins that belong to the genus Spheniscus. The other three banded penguins are the Humboldt penguin (Spheniscus humboldti), the Magellanic penguin (S. magellanicus), which occur along coastal areas of Chile, Peru and Argentina, and the Galapagos penguin (S. mendiculus), which is found on the Galapagos Islands. Wolfaardt, A. African penguins. In: International Penguin Conservation work group. www.penguins.cl/african-penguins.htm. African penguin on the SANCCOB conservation, www.sancoob.co.ca/african penguin. Biodiversity Management Plan for the African Penguin, Spheniscus demersus. Department of Environmental Affairs Gazette no. 36966. BirdLife International 2013. Spheniscus demersus. In: IUCN 2013. IUCN Red List of Threatened Species. Version 2013.2. <www.iucnredlist.org>. Downloaded on 10 June 2014. Dyer Island Conservation Trust. www.dict.org.za/penguins.php. Ginn, P. & McLleron, G. 1982. Waterbirds of southern Africa. Chris van Rensburg Publication, South Africa. Hockey, P., Dean, W.R.J. & Ryan, P.G. 2005. Roberts’ Birds of southern Africa, VIIth ed. Trustees of the John Voelcker Bird Book Fund, Cape Town.